The world has watched the recent events in Japan unfold with shock and horror. Tens of thousands of people killed as towns and villages were wiped away, and then to have the threat of a nuclear accident on top, makes this one of the most devastating things to ever happen to Japan. While aid efforts continue from countries around the world, a slight halt has been put on the rendering of certain cultural events in the country, due to international fears linked to the breakdown of the Fukushima power plant. It has been reported that a show of French Impressionist masterpieces, that were on loan from major French institutions, and were set to be displayed in Hiroshima, has now been postponed. The exhibition was to be shown at the Hiroshima Prefectural Art Museum, beginning on the 5th April, but it is thought that recent nuclear events in the country have stoked up concern amongst the lenders to the exhibition. 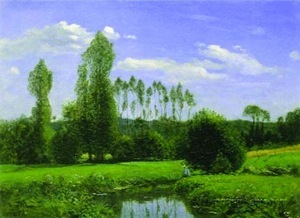 The exhibition was to consist of 84 Impressionist works, from institutions such as The Beaux-Arts museum of Lille and Bordeaux and the Chartreuse Museum in Bouai. It was the French ministry of culture who called for the halt to the show, but have so far failed to comment on the reason for doing so. The Hiroshime Prefectural Art Museum website claims that the exhibition has been postponed due to nuclear scares from the Fukushima power plant, even though Hiroshima is 200 miles south west of Fukushima. Nevertheless, it is clear that cultural institutions are concerned about the impact that the recent devastating events in Japan have had, and will have on important works of art that are shown in the country for the time being.